Vor fünf Jahren haben wir begonnen, an dem Projekt Middle East Peace Tour zu arbeiten. Ein Projekt, das zeigen soll das der Sport die Macht hat, um die Welt zu verändern (die Worte von Nelson Mandela). Brücken bauen, wo die Politik Mauern und Gräben errichtete. Zahlreiche Treffen und Gespräche mit Regierungsvertretern aller Parteien und die Unterstützung der Botschaften (die uns immer wichtige Ratschläge erteilten) und die großartige Zusammenarbeit mit den Gemeinden entlang der gesamten Route motivierten uns noch mehr. Die enge und intensive Zusammenarbeit hat zu vielen Freundschaften mit Jordaniern, Palästinensern und Israelis geführt, und die Region ist zu einer zweiten Heimat geworden. Mit großem Bedauern müssen wir daher die Annullierung der Middle East Peace Tour 2019 bekannt geben. Die Sicherheit der Teilnehmer und Mitarbeiter hat oberste Priorität. Aufgrund der jüngsten Entwicklungen in der Region kann dies derzeit nicht garantiert werden. Da sich das Startdatum schnell nähert, haben wir keine andere Alternative. Der Glaube, dass Sport die Macht hat, die Welt zu verändern, lebt in uns weiter. Denia, Spain for the pre-season training camp. four Grand Tour participations,” Ochowicz said. level after two years at the Continental level. I deserve to be in the WorldTour again,” Zoidl said. Frohe Weihnachten wünscht das Radsport-Forum! After spending the last week with his new teammates at the team’s training camp in Mallorca, Ivan Ramiro Sosa is excited about his maiden season in the peloton with Team Sky. Sosa, who completed the team’s roster for the 2019 season when he put pen to paper on a contract earlier this month, continues the team’s strong connection with South American riders, becoming the fifth Colombian rider to sign for Team Sky. The 21 year old enjoyed a breakthrough season in 2018, claiming an impressive overall victory at the Vuelta a Burgos, in addition to stage race wins at the Adriatica Ionica Race and Sibiu Cycling Tour – and now he’s targeting more success with Team Sky, as he looks to continue his development at WorldTour level next season, joining an ever-growing group of talented young riders on the team’s roster. A close friend of Egan Bernal, Sosa is pleased to have a familiar face alongside him at Team Sky, commenting: “Having Egan here is a big boost for me – he is a good friend and someone I know very well. As well as Bernal, Sosa has got to know the rest of his new team-mates well in Mallorca over the last week or so and he’s been welcomed into the team with open arms. “Everyone has been really welcoming to me,” he said. “There is a nice mix of youth and experience within this team and they’ve all helped me settle in. “Training has been really good and the DS’s and coaches have been great with me too. Team Sky race coach, Xabier Artetxe, believes Sosa’s arrival presents another exciting addition to the team’s roster, adding: „Ivan is a really strong climber. In the long climbs especially, he’s produced some really good performances, but there is so much more to come from him still. Swiss WorldTour team KATUSHA ALPECIN will cooperate for the next three years with BMW. The official handing-over of the keys happened last Friday evening at the 2019 team presentation of KATUSHA ALPECIN in Koblenz, Germany. Leasing company Alphabet is providing the fleet of 14 BMWs, including 12 of the 518d Touring and 2 BMW X3 models. The official route for La Vuelta 19 was today announced at the ADDA auditorium in Alicante. The 74th edition of the Spanish race will take place between August 24th and September 15th 2019, setting out from Salinas de Torrevieja and ending in Madrid. With a distance of 3,272.2 km, the competition includes eight uphill finishes, five of which are new. The presentation was attended by representatives from the international peloton, including last year’s podium: Simon Yates, Enric Mas and Miguel Ángel López; but also national cycling stars such as Alejandro Valverde, the new world champion. FORCE neuer Helm- und Brillenausrüster! Team Vorarlberg Santic wünscht frohe Festtage und alles Beste für 2019! Mit einer ordentlichen Portion Qualität und Style geht es in Richtung 2019. Team Vorarlberg Santic darf auf Jahresende einen neuen Ausstatter mit der tschechischen Marke FORCE präsentieren. Das Familienunternehmen KCK Cyklosport mit Sitz in Otrokovice, vertreten durch COO Ing. Andrea Kmentova´, freut sich auf die bevorstehende Kooperation mit dem österreichischen Profiteam. Die Helme und Brillen überzeugten die Profis voll und ganz beim ersten Test am Mannschaftstreffen durch ihre hervorragende Passform, sowie der hohen Qualität. Wir heißen FORCE herzlich willkommen im Team Vorarlberg Santic! Ein herzliches und sportliches Dankeschön an alle Partner, Sponsoren, Presse- und Medienvertreter für die Zusammenarbeit im vergangenen Jahr! Wir wünschen ein frohes und gesegnetes Weihnachtsfest und einen guten Übergang in das neue Radsportjahr 2019! FORCE new helmet and eyewear partner! Team Vorarlberg Santic wishes you merry christmas and all the best for 2019! With a good dose of quality and style, we are heading towards 2019. At the end of the year, Team Vorarlberg Santic will be presenting a new outfitter with the Czech brand FORCE. 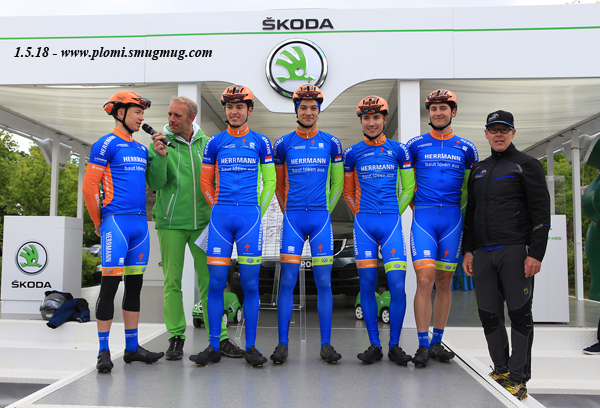 The family business KCK Cyklosport based in Otrokovice, represented by COO Ing. Andrea Kmentova‘, and looking optimistic forward to the upcoming cooperation with the Austrian professional team. The helmets and sunglasses convinced the pro riders fully at the first test at the team meeting due to their excellent fit, as well as the high quality. We warmly welcome FORCE to Team Vorarlberg Santic! Many and sporting thanks to all partners, sponsors, press and media representatives for the cooperation in this year! 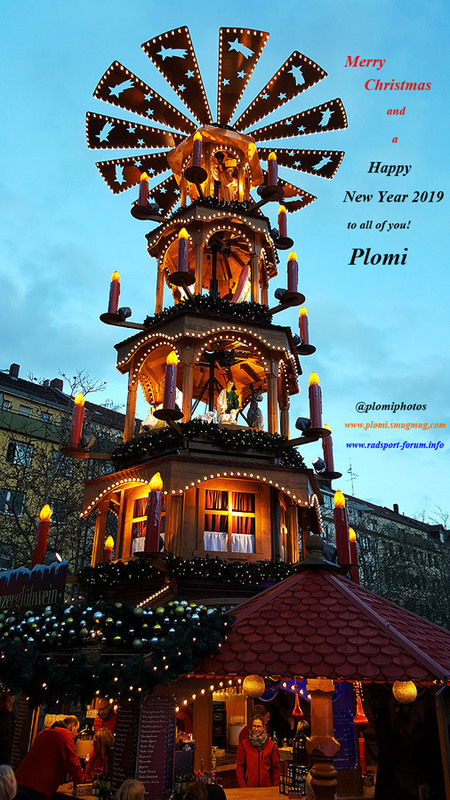 We wish you a happy and blessed Christmas and a good transition to the new cycling year 2019!